Cardona Counseling Services is located in the University Business Center [4500 9th Ave NE, Suite 300, Seattle, WA 98105] in the same building as the AMC Seattle 10 (formerly Sundance Cinema) in the University District just off of I-5 at the corner of 45th and 9th. The office suites are located on the 3rd floor. The entrance to the business center is just to the left of the theater entrance. Take the elevator to the 3rd floor. I'm in office #49. Please call, email, or send a message below. Please type “Re: Therapy” in the subject line so I do not miss your email. There is 2-hour street available. There is city paid parking available. For street paid parking, unrestricted, and restricted parking zone (RPZ) information, please visit http://web6.seattle.gov/sdot/seattleparkingmap. Park in one of the available spots. Go to the pay station in the parking garage (located by #73). Follow the prompts, and enter code 4500 to register for one hour of free parking. For one (1) additional hour of parking: Activate the machine again, Follow the prompts for an additional hour of parking, Enter code 4501 to purchase an extra hour of parking. You can always pay for parking in the Diamond Pay Lot directly across from the University Business Center. The parking lots are managed by Diamond Parking (206) 729-0590 or (800) 828-4197 for questions or concerns. Parking for those with a disability: For those with a WA State Disabled Parking Privilege plate or placard, you may park in the lot directly across the street, in any of the handicapped stalls. Parking is free with plate or placard displayed. 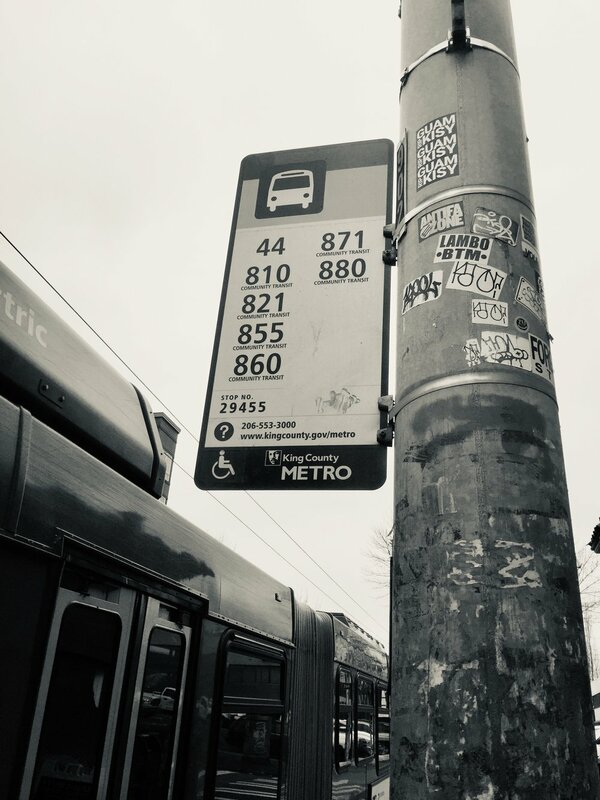 For those using King County Metro, the closest stop number to the University Business Center is 29455 (see image below), Westbound near the corner of 45th Street and 9th Ave.